532: ‘Dr Sk8board’ Mike Coyle checks in from Florida. Found a classic pic..from a ramp called 301….from around 1988 or 1989….the deck im riding is a “bogey” deck…billy “bogey” beauregard….he hand cut and shaped the one im riding and he did the graphics by hand also….the other pic is me doing a nice solid invert on the pool coping sans helmet…yikes! 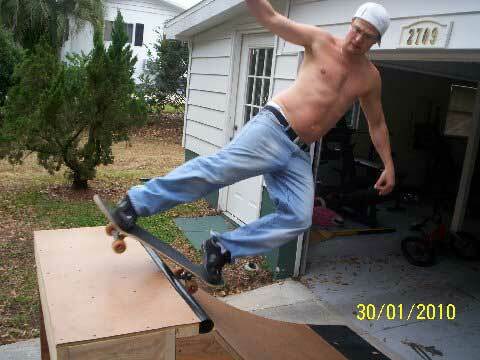 I never visited Florida for any skating reasons but I know alot was happening there and Mike has sent in some cool stuff for the archive, which I will get too. I also dug the hand cut and hand painted Billy Beauregard deck (who I will get to). Too bad the Wall Street Journal did not just run an article on board art from the 80’s, that would have been a better read. This entry was posted in Mike Coyle, Uncategorized and tagged 301 ramp, ART, backyard ramps, boards, diy, dr sk8board, east coast, florida, house of steam, independent, jason, Jason oliva, jasonoliva, landshark wheels, Mike Coyle, New Jersey, New York City, old school, old school skateboarders.thos shop, oliva, paintings, photography, pool Skating, ramp, ride, sarasota, sk8, sk8t, skate, skate decks, skate history, skate photography, Skate ramps, skate stickers, skate trucks, skate wheels, skateboarding, skateboarding history, skateboarding photography, skateboarding podcast, skateboards, skatepark, skater, SKATERS, steam, Stickers, Street Skating, TEAM STEAM, The Barn, The House of Steam, the house of steam shop, the house of steam video podcast, thos, those, those shop, those video podcast, underground, underground skateboards, vert, vert ramps, Vert Skating on March 14, 2010 by jasonoliva.